Any driver in a semi will either see, or be involved in these types of events with any amount of time behind the wheel. There is often a lack of driving etiquette from the others who share the road with us. Their actions sure make a mess of things at turns, and I will never ever understand why the game of "chicken" is involved between a car and a big truck. Sometimes our size just freaks them out and they just want to get out of the way! Sometimes they get in the way and don't even know it - at least not at first! I had a car behind me who just could not wait as I made my left turn. As I turned onto the 4 lane divided city street with my tandems next to that curb divider, that blasted car passed me on the left and went up and over the curb nearly striking the tractor on the drivers door!! I was furious! This was a young driver and naturally there were no cops around when you need one. Major city. Summer time. Noon hour. Construction being done on the southbound lanes of a 3 or 4 lane road both ways so one lane in the north bound lane is for south bound traffic. I just came off the Interstate and am on the ramp first in line. What a mess. Going to be a very tight left turn and their might be no room depending on what traffic does. Traffic cones everywhere and even if I swung to the right as much as I dared so I could maybe have a better chance of clearing the car next to my south bound lane, the traffic behind me will try passing me on my left and create a bigger headache. My light turns green and I proceed slowly and keep an eye on the left side so no one can pass me. I had to be very careful since the southbound lanes are now gone and there is that huge drop off. The car first in line on the road I'm turning onto stops ahead of the white line and there is no way I can make the turn. 6,000 witnesses and everyone can see we are now stuck and I am blocking the intersection along with the cars behind me from the ramp. The woman in the car just looks at me like its my fault. I set the air brakes. That has a good effect!!! I remember some north bounders laughing at the car and they were giving me the "glad its you and not me". Woman just kept looking at me like she's waiting for me to move. I told her, "If you had stayed behind the white line you wouldn't have caused this mess!" The three cars behind her had left enough room so she had to back up. By now a lot of people became impatient and horns were blowing. Finally she backed up and I was able to safely make the turn. For you newbies, and others too, you may wonder why I didn't turn right. I was in the left lane on the ramp and not the right lane. Also, in some cities you will find that on the off ramps, trucks can only go one direction because the other direction is restricted for trucks. You also cannot just sit and wait for traffic to clear at a busy intersection. It never will. Another time I was on a wide city street, and looking for my right turn into a customer whose street was also a wide one. As I approach my corner, a car arrives at the stop sign. I turn on my turn signal and another car stops behind the first car. Now I am turning and I am about 8 feet from the cars and the trailer tandems are about 4 feet from the curb. Car 2 decided to get out of my way when I was bent like an "L"with my wheels cranked to the right and I see him go forward and to the right and bump into the first car! Another time I made my turn and a car was coming onto the residental street. They slammed on the brakes and backed up two city blocks to get out of my way (someone warn them I was coming?!). I laughed.They must have had a bad experience with trucks using this route. There was plenty of room for us to meet up and pass without mishaps. Each turn you do is different, and you never know what to expect. There are many examples like these, and the ones I shared are just a few of them. 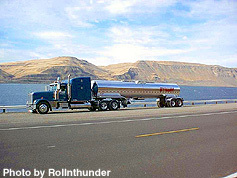 You need to be alert and watching closely when you are making turns in a semi.